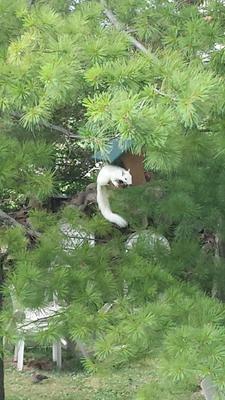 This true white squirrel was seen in my brother's tree having lunch in Saint Joseph Ontario. Thank you for sending us this picture of the charming white squirrel - I'm sure our readers will love it! Wow, how cool is a white squirrel! I feed the squirrels at our house, we have had a red squirrel on occasion but never a white one, probably an albino! How great that you got a photo.